New Zealand Police are urging the public not to share a video that appears to show a gunman opening fire on worshippers during a deadly mass shooting at two mosques. New Zealand Police are urging the public not to share a video that appears to show a gunman opening fire on worshippers during a deadly mass shooting that killed at least 49 people and injured dozens more at two mosques during Friday prayers. The video was apparently livestreamed on Facebook for 17 minutes by one of the alleged attackers and shows him entering one of the mosques in Christchurch and repeatedly shooting victims. The gunman then walks outside into the street where he shoots at more people on the sidewalk before returning to his car for to retrieve another rifle. The footage then appears to show the shooter enter the mosque again where victims can be seen lying on the ground. He exits the mosque and fires at another woman before he drives off in his car. The man can be heard yelling “I am the god of hellfire” in the video as he drives away. Soon after the video was livestreamed, a spokesperson for Facebook New Zealand said they had removed the video from their platform. 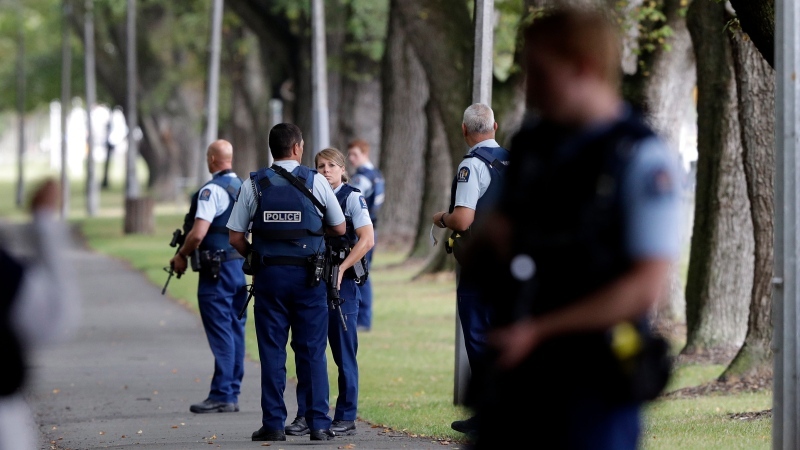 “New Zealand Police alerted us to a video on Facebook shortly after the livestream commenced and we quickly removed both the shooter’s Facebook and Instagram accounts and the video,” spokesperson Mia Garlick said in a statement on Friday. In a statement, New Zealand Police asked social media users to refrain from sharing copies of the video that have proliferated on several online platforms following the livestream. “Police are aware there is extremely distressing footage relating to the incident in Christchurch circulating online. We would strongly urge that the link not be shared,” police said. Steve Moore, a retired supervisory special agent for the FBI and CNN legal enforcement analyst, said the disturbing video could inspire copycats. CTV News Public Safety Analyst Chris Lewis said the gunman’s apparent livestream is a worrisome aspect of the attack. Twitter said it had suspended an account believed to be related to the shooting and were working to remove the video from its platform. YouTube said in a tweet that their “hearts are broken over today’s terrible tragedy” in New Zealand. One man has been arrested and charged with murder in the attack. Two other suspects are being held in custody, but have not been charged.